Episode 1: The First Issues! Check out our first episode: Episode 1: The First Issues! 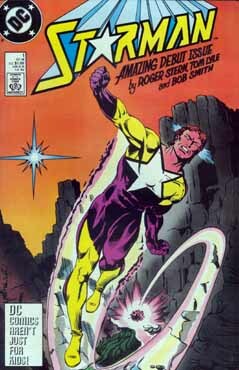 First I look at the first issue of Starman! Dr. Harold Melrose is trying to create a group of super-beings using radiation from deep space directed to Earth with a satellite. During the experiment, the satellite is struck by space debris and knocked out of alignment. The radiation beam is directed into the mountains of Colorado where unemployed Will Payton is camping. Will is found by two hikers. The ground around him is charred, his skin appears burned, and he is believed dead. When the local coroner examines him though, Will rises from the table. Startled by the experience, Will flees and discovers he now possesses amazing strength, invulnerability, and the power to fly. Using these new powers which also include the ability to radiate heat and light, he stops a bank robbery. Will then tracks down his sister Jayne. She was worried because he was missing for more than a month. Will has no memory of the previous 34 days. Jayne convinces Will to become a super-hero and creates a costume for him. Reluctantly, Will accepts the costume and rescues a trapped construction worker. He is dubbed Starman by onlookers and the press. When word of Starman reaches Dr. Melrose, he deduces that the satellite power was redirected to the new hero. The doctor resolves to get the power back by any means necessary. 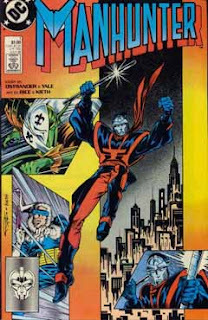 Then we look at the first issue of Manhunter. Mark Shaw has resumed his masked identity as the Manhunter and is now working as a bounty hunter. He apprehends the Penguin and turns him over to the police for a reward. Mark then returns home to meet his family for a party to celebrate his half-sister's successful completion of the Bar exam. Meanwhile a killer named Dumas impersonates a catholic bishop in order to assassinate Bishop Damian M'Butu. Dumas was hired by a racist businessman who transfers payment when the job is done. Mark next goes after Captain Cold. He follows him home from a Mets game, then trails him to the site of a drug deal. Captain Cold plans to steal from the drug dealers, but Manhunter sees that the police and reporters already have the location staked out. Manhunter is then caught on camera as he apprehends Captain Cold (who will next appear in Suicide Squad 16... check out The Task Force X Headcast for further information....). After seeing Manhunter on the news, Olivia Vancroft contacts her associate to acquire Manhunter's mask which she intends to add to her collection. She demands that Dumas be hired should the mask prove difficult to get.